Download Sample Chapters for free! Release Date: September 26, 2018! Pre-Release Date Orders accepted at most ebook stores. 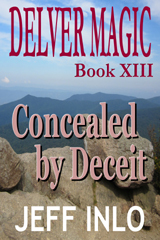 Concealed by Deceit is the Thirteenth novel in a fantasy series written by Jeff Inlo and follows Essence of the Chase. The first four chapters of the book are available for download for free on this site. These files are all DRM-Free. The full book can be purchased from Smashwords, Barnes and Noble, Google Play, Apple, Kobo and Amazon for only $.99. For more information about the book, you can review the short summary that follows this introduction. You may also sample several chapters for free before purchasing the complete book. Click here for Delver Magic updates on Facebook! To purchase from Apple or Google Play, please utilize their respective software and use "Jeff Inlo" as a search term to find the book. If you have problems or difficulties with any of the formats, please contact the author. Quick Download - Try for Free! This is the download for Sample Chapters only. If you wish to obtain the complete book, you can purchase it at Smashwords, Barnes and Noble, Amazon, Kobo, Google Play and other on-line stores for only $.99. This section is for the convenience of downloading the sample chapters of Delver Magic Book XI: Emptiness Filled with just a click. For pdf and txt formats, right click and select "Save Link or Target As..."
A wizard capable of casting spells with colorless magic sets his sights on Ryson Acumen. He blames the delver for fostering false beliefs upon the people of Uton. Rather than taking credit for his victories over Rul Saattan and other powerful creatures, Ryson has allowed individuals to consider the power of Providence and the potential enrichment of blessings and grace. The spell caster decides that such ignorance must end. The wizard develops a plan to destroy the delver and shatter any considerations associated with his previous accomplishments. He believes that when Ryson Acumen falls, the people of Uton will question their established understanding of false idols. The magic caster acquires the services of a malevolent spirit and raises an army of dark creatures. He brings his formidable powers to Ryson's hometown even as he convinces the delver to explore a potential secret hidden within the Sword of Decree. When the delver returns, he realizes any hope of escape has been removed. He never expected to be deceived to a point where his friends were threatened by a horde of goblins and the spirit of Sy Fenden was brought to near complete destruction. The treachery he faces exceeds any of his previous encounters with demons and dark creatures. Even when he attempts to outrun his foe, he cannot overcome the numerous obstacles set against him. In the end, he is forced to accept the constraints of his own destiny and choose trust over suspicion. As the Delver Magic Series has developed over time, it has become more important to read the previous books. I try to make each story separate and complete without any cliffhangers, but in order to develop the characters properly, I've relied heavily on their experiences in earlier adventures. Concealed by Deceit can certainly be read on its own, but it will help substantially to understand how previous events have shaped some of the characters' perspectives. While it is not necessary to read Delver Magic in its entirety to enjoy the books later in the series, it is helpful to have a knowledge of the characters and events by reading the series in order. The first three books of the series are available for free. Please use the links above for more information on how to obtain all of the previous Delver Magic titles. As I have done with books 4 through 12, Concealed by Deceit will be available through on-line retailers such as Barnes and Noble, the Apple iTunes store, Kobo, Amazon.com, Google Play and Smashwords. Free ebooks are often downloaded but not always read. The slight charge of $.99 should continue to give me an idea regarding the popularity of the series and whether or not I am maintaining the interest of readers. I've tried to make the sample chapters and the full ebook of Concealed by Deceit available in as many DRM free formats as possible. With so many new devices and software applications used for reading eBooks, it's difficult to ensure that every format works as it should. If you have any trouble with any of the formats, please contact me. I will do my best to fix the problem. If you do enjoy Delver Magic, please let me know. I appreciate hearing from those who take an interest in my work. Thank you for your time. I know there are countless eBook offers out there. I am grateful you have made the effort to review this site.